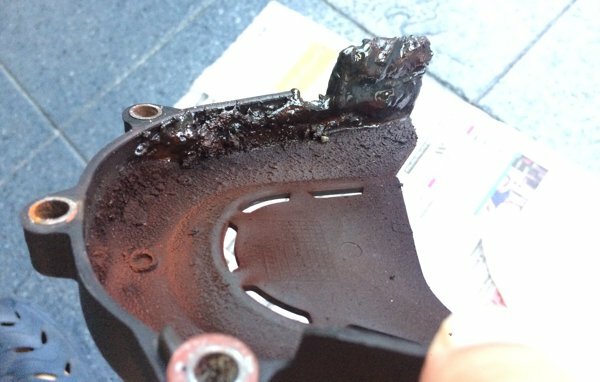 MASSIVE amount of accumulated gunk around the front sprocket cover. 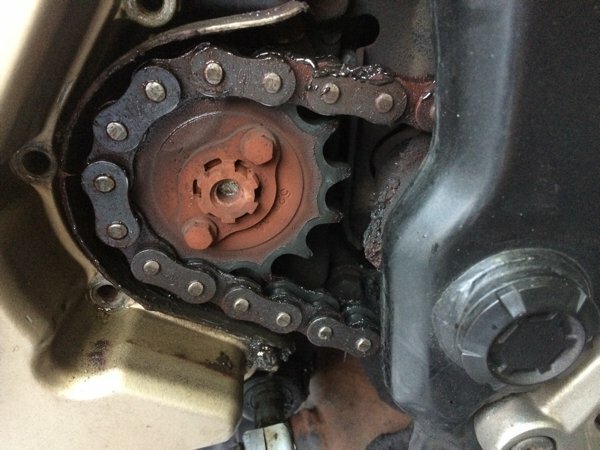 Initially, I had suspected that it was due to my poor chain maintenance practices – yes, while I do occasionally clean the chain, but I’ve never removed the front sprocket cover and cleaned the sprocket area prior to this. And so I cleaned up the area and would now periodically open up the cover for cleaning. But, things didn’t seem to get any better. =( Even with a brand new chain and continued periodic cleaning, the sprocket area (and along the chain) was still accumulating lots of grimy gunk. And I hated it – primarily because I knew very well that it’s exactly this grinding paste that would accelerate chain wear. Grime surrounding the newly installed chain at the front sprocket area. Not too impressed with this amount of accumulated Motul C2 paste at just 800km. The Motul C3 (off road) chain lube. Since then, I’ve traveled more than 3,000km with several applications of the Motul C3 lube along the way. I’ve even recently returned from a 2,000km round trip from Singapore to Betong (Thailand), riding on a possibly complete range of road conditions – from the regular tarmac, to high-speed highway runs, in rain, gravel, dusty roads, some off-roads, and even riding my Pulsar 200NS through a river crossing! Motul C2 on the left, and Motul C3 on the right. 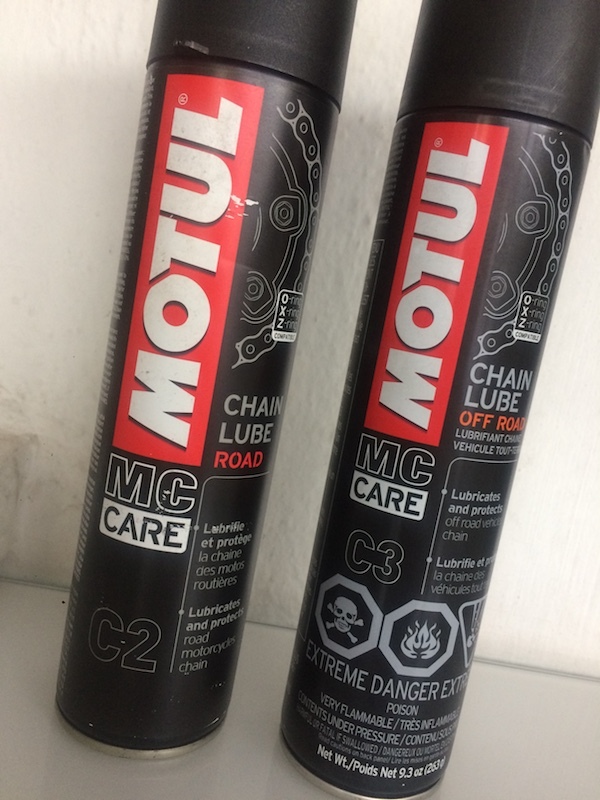 So, how did the Motul C3 (off road) chain lube compare with the Motul C2 (road) lube? First, I’ll comment on the effectiveness of the chain lube. Quite frankly, I cannot tell if the Motul C3 or the Motul C2 chain lubes protects the chain better. Both seem to do their job real fine. The C3, like the C2, kept my chain well lubed and quiet as long as I applied it regularly. Even after a 700km high-speed highway run traveling from Singapore to Betong, the chain o-rings (actually, it’s x-rings on my DID) still appeared “moist” and “well lubed” at the end of the ride. So, in terms of longevity – I’d say both are about equal. Cleanliness – this is where the Motul C3 (off road) shines. And shine VERY much indeed! The Motul C2 (road) lube was specifically formulated to be a sticky and tacky lube. While this is great to prevent fling, it also has the (BIG) problem of attracting dirt. Road dust and grime adhere to the lube and chain, creating a grinding paste. This grinding paste, when run with the chain contributes to accelerated chain wear (in theory at least). Think of it as a paste of sandpaper (heck, it IS actually road sand mixed with lube) stuck onto the chain – not a great combination for chain longevity. 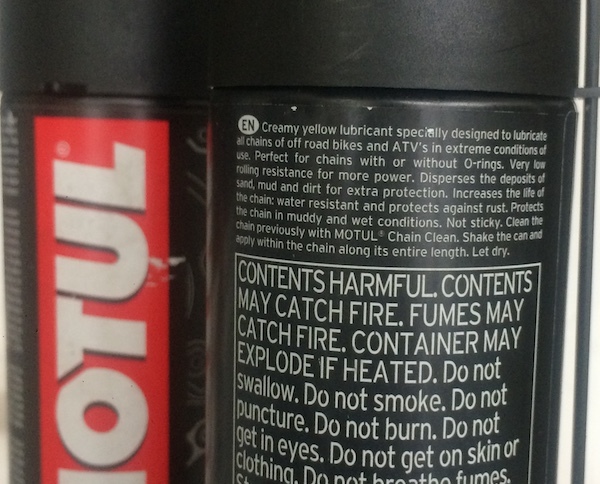 The Motul C3 (off road) specifically mentions on the label that it is non-sticky. It applies on like a luminous green thick oil which helps to show where the lube reaches and where you possibly might need to put a little more. Being non-sticky means that it’s VERY resistant to dirt and dust adhering to it. But the surprising thing is, like the Motul C2, I did NOT get any fling at all with the non-sticky C3! In fact, there was once when I applied a little too much of the C3 and didn’t wipe down the chain, the slight excess lube fling around the front sprocket area (and surprisingly NONE around the rear sprocket area) didn’t create a pasty mess, but instead dripped (only a very small amount) onto the ground beneath the bike like some thick oil leak. All these while still maintaining the front sprocket area and the chain relatively clean! 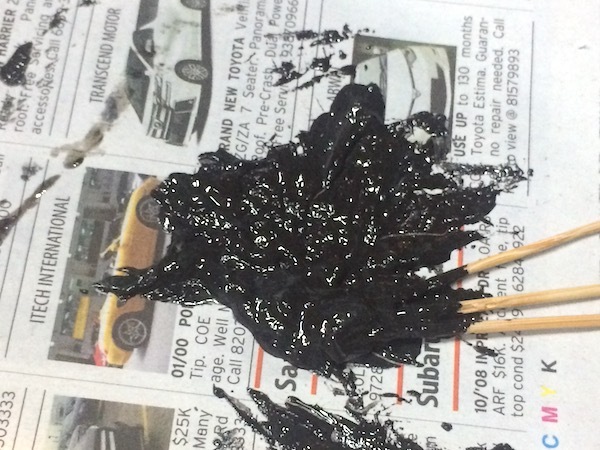 The C2 would have immediately started creating a messy gooey paste instead. Motul C3 (off road) description – NOT sticky. Protects chain in muddy and WET conditions. Chain cleaning was also a lot easier with the C3 than the C2. All I needed was a light coat of WD40 and an old oily rag. Unlike the C2, I didn’t even have to whip out my chain brush to get in between those hard-to-reach places because the chain was already generally clean! Chain cleaning while I was on the C2 lube was, on the other hand, a very messy and sticky affair. Yes, I know, the C3 was designed for “off road” use, while the C2 is for “on road” use. 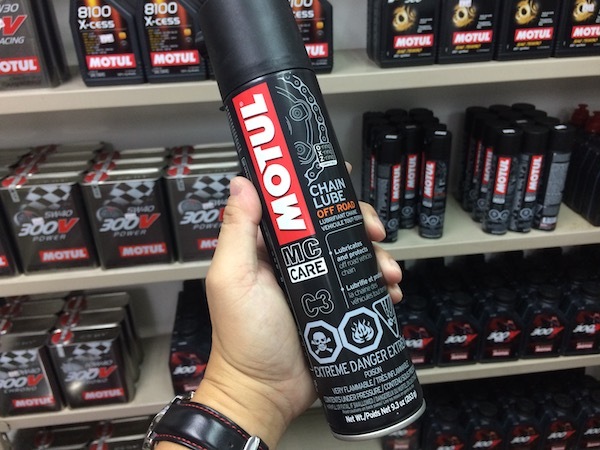 But with the frequent rain we experience in tropical Singapore kicking up road grime onto the chain, I’d reckon that the Motul C3 (off road) chain lube is probably more suitable for my motorcycle chain. 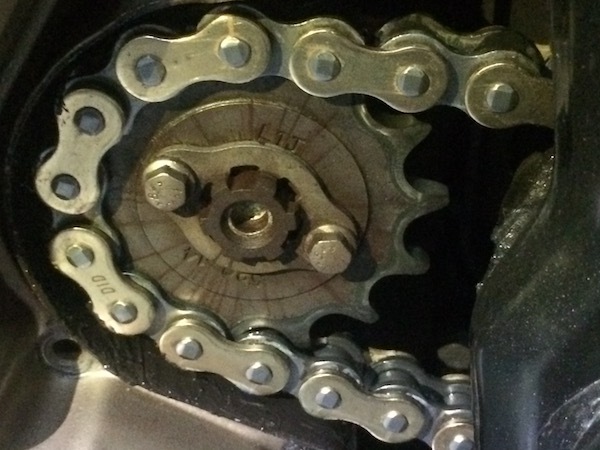 A healthier, happier motorcycle chain. And a happier biker too! 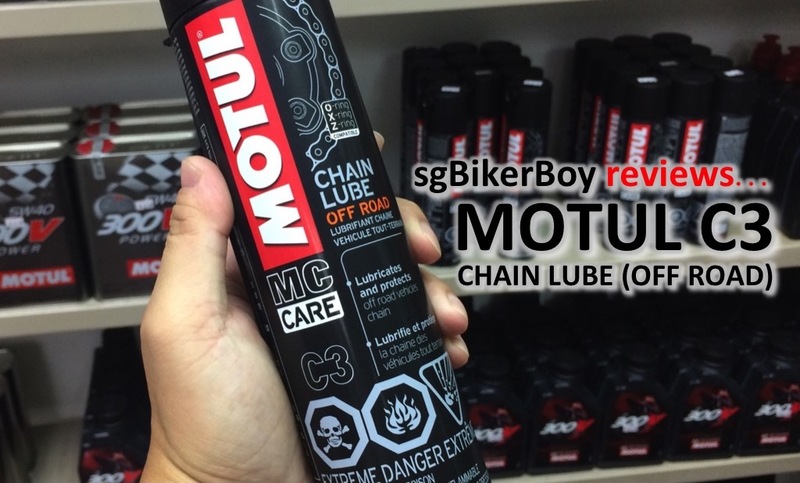 Interestingly, I do not know of too many places in Singapore selling the Motul C3 (off road) chain lube. Lynlex SG seem to be one of those very few shops that bring it in. Their showroom is at 3 Upp Aljunied Link, #01-02 Joo Seng Warehouse. 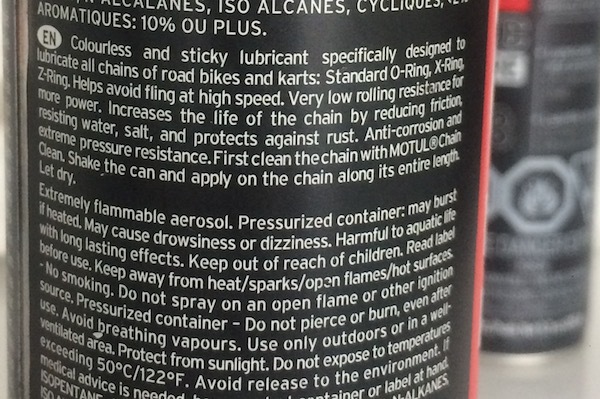 bro, wd40 is actually very bad for motorcycle chains. google around and you will know what i mean. but nonetheless, great review!